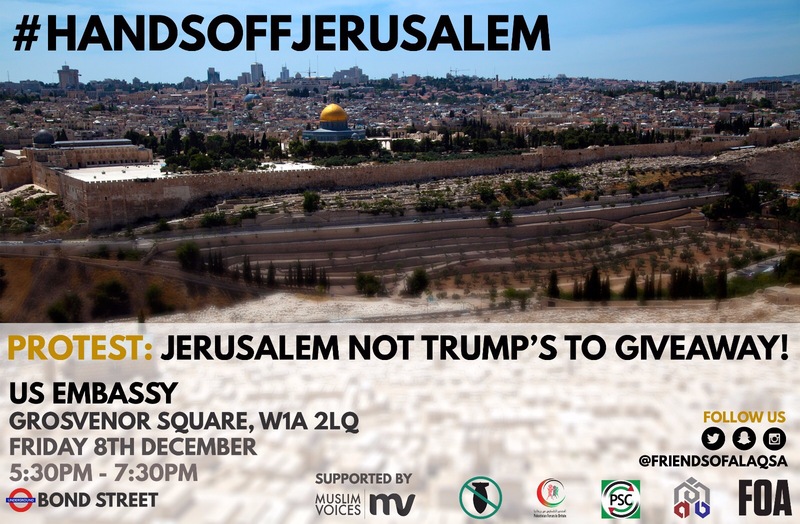 On Friday, our organisations co-organised a protest outside the US embassy in London to protest President Trump’s decision to recognise Jerusalem as the capital of Israel and his intention to move the US Embassy to Jerusalem. The protest was attended by more than 3000 people and was peaceful. We have been made aware that after the main demonstration had disbanded some of those who had been present remained and chanted slogans which demonstrated hatred and advocated violence. We deplore such behaviours, which are not, shared or endorsed by our organisations or by the vast majority of those who attended the demonstration. As organisations, we stand against racism and discrimination of all forms including antisemitism. They have no place in our movement which is rooted in principles of recognition of the respect owed to all and the rights that belong to all regardless of race, ethnicity gender or religion. We remind all those who attend our demonstrations, protests and events of the need to ensure all aspects of their behaviour are in line with these principles.